Where did you find your sewing spark? Bold new quilts & classic new collections for SPRING. This morning I am writing from the road, on my way to the city where I pieced my first quilt. I grew up gathering around quilts stretched on a frame where, stitch by stitch, I learned the art of hand work. Looking back, I see how kind my mom, grandmother and aunts were as they threaded needles, tied knot after knot for me and left my stitches - imperfect as they were - as part of the heirloom they were creating. As much as I enjoyed those times, I had zero desire to sit down at a sewing machine. It wasn't for a lack of mother's encouragement. She tried and TRIED to persuade me but I just wasn't interested. It wasn't until I had a child of my own and I lived in a city far away that my sewing spark was lit. Mom came for a visit. I knew she would enjoy exploring the local quilt shops while in town. While she browsed the fabric, a quilt book saturated with color caught my eye. I thumbed through Kaffe Fassett's Glorious Patchwork and for the first time thought, "I want to sew this. I HAVE TO SEW THIS!" The way he infused traditional quilt patterns with his bold designs fascinated me and I found myself thinking of new ways to view the historic art of quilt making. It was only a matter of days before I was sitting at a sewing machine, piecing my first quilt. I have grown to love and appreciate all styles but it's the richly saturated colors used by designers like Kaffe, Amy Butler, Anna Maria Horner, Bari J. and Denyse Schmidt that bring me back to my sewing machine again and again. It's no surprise that my heart skipped a beat when Marianne Michaels walked through the door with this striking quilt fresh from her own sewing machine (talk about a woman with a sewing spark)! Mystic Gold is a quilt pattern designed by Anna Maria Horner of Free Spirit Fabrics. It features gorgeous prints from her Floral Retrospective collection. 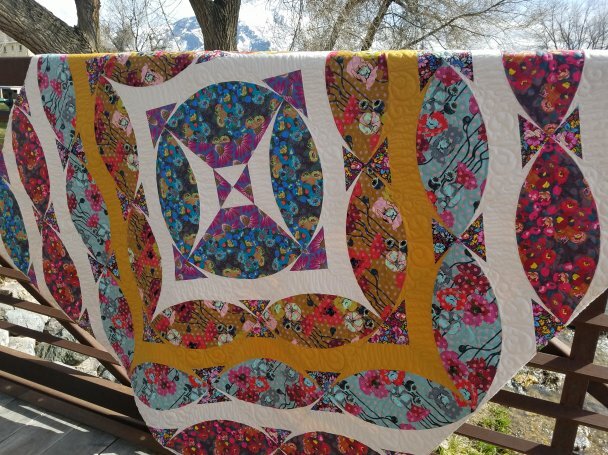 Custom machine quilting with a modern flair by Ramona Sorensen. Kits and yardage are available now at the shop! Spring is here! And with it comes this cute little Garden Intruder. It won't be long until we're planting seeds for future harvest in The Pumpkin Patch. 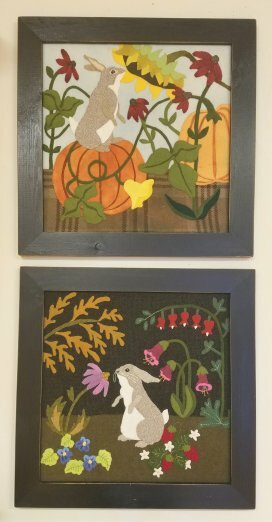 Our mischievous, furry friend is found filling his bunny senses in each 17" x 17" wool applique garden block from the Bunny Rabbit pattern series by Jerome Thomas Designs. Marianne Michaels' selection of hand-dyed wools adds just the right textural character to each seasonal scene. Kits available! Interested in wool applique but aren't quite sure where to start? Click the "classes" link below to learn more about our "It's All About the Wool" Club and our FREE Wool Applique Demos. 3 Sisters. Need I say more? Always lovely. Always a must have. The 3 Sister's new Victoria collection for Moda is no exception. 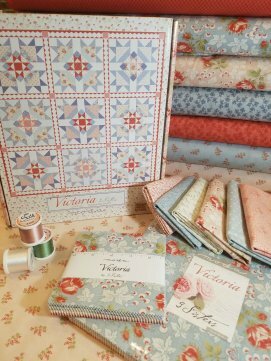 Suzanne Adams is busy sewing up a sample of the beautiful Victoria quilt shown here in Moda's boxed kit which is available at the shop while supplies last. We have yardage and precuts as well! Seats are still available to learn how to make this unique bag that opens out into a tray then zips closed into a rectangular pouch! $20.00 class fee. Supplies purchased separately. See our website under classes for photos and for registration details. March 26th - 25% off KITS! This sale includes regular price quilt kits, cuddle kits, hemstitching kits & select wool applique kits! You can find links to our social media profiles on our website.